Is Sustainable-Labeled Seafood Really Sustainable? Industry demand for the "sustainable seafood" label, issued by the Marine Stewardship Council, is increasing. But some environmentalists fear fisheries are being certified despite evidence showing that the fish population is in trouble — or when there's not enough information to know the impact on the oceans. Can consumers feel confident they're helping the oceans when buying "certified sustainable" fish? Capt. Art Gaeten holds a blue shark that was caught during a research trip in Nova Scotia. Scientists are studying the impact of swordfish fishing methods on the shark population. Part one of a three-part series by Daniel Zwerdling and Margot Williams. Rebecca Weel pushes a baby stroller with her 18-month-old up to the seafood case at Whole Foods, near ground zero in New York. As she peers at shiny fillets of salmon, halibut and Chilean sea bass labeled "certified sustainable," Weel believes that if she purchases this seafood, she will help protect the world's oceans from overfishing. But some leading environmentalists have a different take: Consumers like Weel are being misled by a global program that amounts to "greenwashing" — a strategy that makes consumers think they are protecting the planet, when actually they are not. At Whole Foods, the seafood counter displays blue labels from the Marine Stewardship Council (MSC), an international, nonprofit organization. The MSC is a prime example of an economic trend: Private groups, not the government, are telling consumers what is good or bad for the environment. The MSC says its label guarantees that the wild seafood was caught using methods that do not deplete the natural supply. It also guarantees that fishing companies do not cause serious harm to other life in the sea, from coral to dolphins. The idea is spreading fast throughout the food industry. Megachains like Target, Costco and Kroger are selling seafood with the MSC label. McDonald's says you are munching on "certified sustainable" wild Alaskan pollock every time you eat a Filet-O-Fish sandwich. 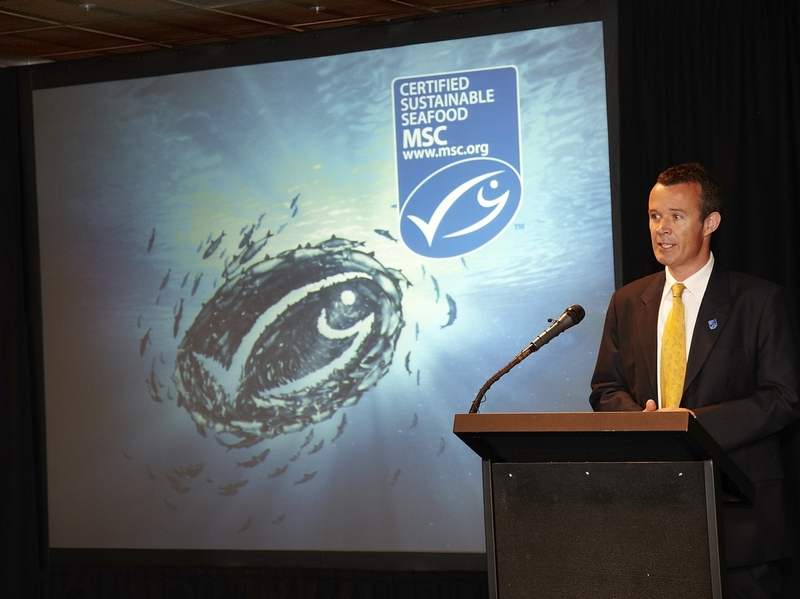 The fast-food company has used MSC-certified fish since 2007 in the U.S., and as of February, they are putting the MSC logo on their fish sandwich boxes. Poll results from a recent survey of 3,000 Americans, conducted on behalf of NPR, by Truven Health Analytics. Questions were asked — in general — about sustainable seafood and labeling. Consumers like Weel say the labels help them feel better about the products they buy. "I want to feel that I'm doing the right thing," says Weel, a pediatrician, as her 4 ½-year-old daughter bolts into the vegetable aisle in neon-colored boots. When Weel shops for seafood, she says, she wants to make choices "that will help preserve the wild fish populations in the oceans." Executives at Whole Foods say they are helping consumers do exactly that, by pledging in recent years to sell as many MSC-certified products as possible. Seafood is the last major food that people catch in the wild, and "we can't just go out and find more fish to catch," says Carrie Brownstein, global seafood quality standards coordinator for Whole Foods. Brownstein cites a 2012 United Nations report that warned that almost 30 percent of the world's wild fisheries are "overexploited," and more than 57 percent of wild fisheries are "at or very close" to the limit. Other groups have devised ranking systems for seafood. The Monterey Bay Aquarium labels products like a traffic light — green, yellow or red — to urge shoppers to buy or avoid a particular fish. The Blue Ocean Institute has a similar system. The MSC reports it has labeled roughly 8 percent of the global seafood catch, worth more than $3 billion. That makes it the most widespread and best-known rating scheme around the world. A recent survey of 3,000 Americans, conducted on behalf of NPR, suggests that a majority of consumers want to feel good about the seafood they buy. The poll by Truven Health Analytics found that almost 80 percent of the people who eat seafood regularly said it is "important" or "very important" that their seafood is sustainably caught. If they buy MSC-labeled seafood, they may be paying a premium. Brownstein says Whole Foods charges more for some of its seafood labeled "certified sustainable," although she wouldn't give numbers. Some fishing industry executives told NPR that they are getting roughly 10 percent more for their MSC-labeled products than for seafood that's not certified sustainable. "We would prefer they didn't use the word sustainable," says Gerry Leape, an oceans specialist at the Pew Environment Group, one of the major foundations working on oceans policies. Leape has supported the MSC for more than a decade as a member of its advisory Stakeholder Council. But he and other critics say that the MSC system has been certifying some fisheries despite evidence that the target fish are in trouble, or that the fishing industry is harming the environment. And critics say the MSC system has certified other fisheries as sustainable even though there is not enough evidence to know how they are affecting the environment. When a customer sees the MSC's sustainable label at the supermarket, "the consumer looks at the fish and says, 'Oh, it has the label on it, it must be sustainable,' " Leape says. "And in some fisheries that the MSC has certified, that's not necessarily the case." Biologist Susanna Fuller, co-director of marine programs at Canada's Ecology Action Centre, agrees. "We know ... that blue stamp doesn't mean that you're sustainable," she says. When asked if consumers should choose MSC-labeled seafood, Fuller pauses. "It's a gamble," she says. Still, even the MSC's sharpest critics say they support the broad ideas behind the organization and its stated goals. "Originally I thought it was a good idea," says Jim Barnes, director of the Antarctic and Southern Ocean Coalition, a network of dozens of environmental groups around the world. "The world needed something like this to help steer consumer decisions, and so I wasn't against it at all at the beginning. And I'm not totally against it now." But Barnes worries that the MSC is straying from its mission and needs a dramatic overhaul. "It can be a force for good. If it continues on the path that it's on, however, and doesn't solve a lot of these issues that have been raised," he says, "I don't think it will be." The MSC was born because of a crisis. Michael Sutton, one of its founders, says that he and his colleagues dreamed up the idea after the cod industry collapsed off the Nova Scotia coast in 1992. Cod fishing had been the foundation of the region's economy and culture, worth an estimated $700 million each year. But when the cod population plunged to a fraction of previous levels, the Canadian government banned cod fishing — putting thousands of people out of work. Rupert Howes is CEO of the Marine Stewardship Council. 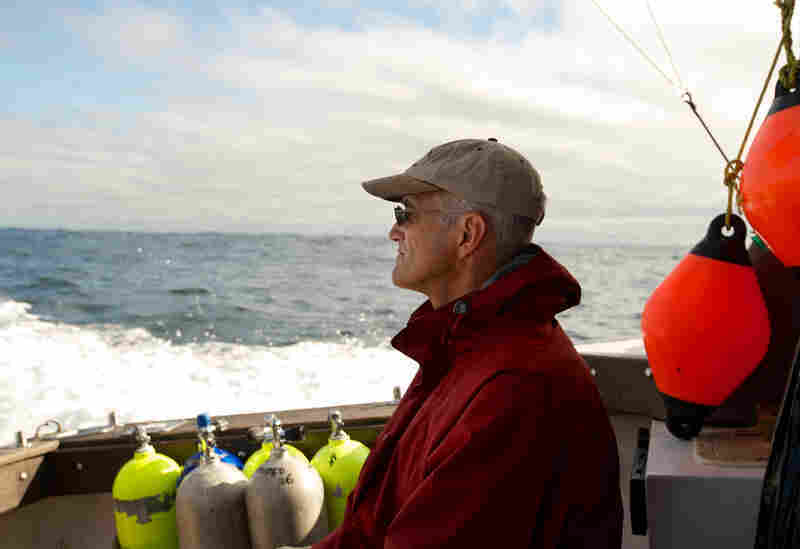 "We want to see the global oceans transformed onto a sustainable basis," he tells NPR. "It was so bad in some of these coastal communities, the government had to send in suicide-prevention teams," recalls Sutton, who was then vice president of the World Wildlife Fund. "We were not only trashing our marine environment, but we were ruining the character of coastal communities that had existed on fisheries for centuries," Sutton says. Sutton and other environmental advocates, and many scientists, warned that the cod collapse taught the world a sobering lesson: Government agencies that were supposed to monitor and regulate fishing were often doing a lousy job. Cod weren't the only fish in trouble. Studies showed that populations of major species like swordfish, marlin and tuna were plunging too. "So we needed to do something drastic," Sutton says. He and colleagues decided to convince industry executives that protecting the oceans would also protect their bottom line. Sutton made a pilgrimage to the Unilever conglomerate, then one of the largest producers of frozen seafood — including fish sticks. "My pitch to Unilever was, 'The future of their frozen fish business is at stake,' " Sutton remembers. "Overfishing is not only bad for the environment, but it's really bad for business, because it means that they're not going to have fish in the future the way they have them today." Unilever and the World Wildlife Fund joined hands in 1997, and set up the MSC. Unilever eventually sold its seafood subsidiary and left the program, but the founding partner left its mark: From the day the MSC opened its doors in London, it has been a balancing act between industry and the environment. Today, the MSC has more than 100 employees worldwide, including about 60 at its headquarters in a renovated building down the street from St. Paul's Cathedral. "MSC has a global vision," says Rupert Howes, the organization's chief executive officer. "We want to see the global oceans transformed onto a sustainable basis." Swordfish from Canada are marked with a label from the Marine Stewardship Council at a Whole Foods in Washington, D.C. The MSC says its label means the fish were caught by a sustainable fishery, but critics says it's not always so clear. Here's the MSC's basic idea: Executives of a growing number of food companies want to be "green." Some genuinely want to protect the environment; others may be mainly seeking a marketing edge. But when it comes to seafood, those executives don't have the time or knowledge to figure out which fishing companies are plundering the ocean and which ones are doing a good job. So the MSC does the work for them. The MSC does not certify fisheries itself. Instead, a fishery that wants the label hires one of roughly a dozen commercial auditing companies to decide whether its practices comply with the MSC's definition of "sustainable." The MSC's standard for sustainability includes dozens of items, but they're designed to assess whether the population of a fishery's target species is healthy; if the fishing practices don't cause serious harm to other life in the sea — including by accidentally catching other animals, which is called bycatch; and if the fishery has good management. If the commercial auditors give the fishery a passing score, then the fishery gets the right to use the blue "Certified Sustainable Seafood" label. It can be a long and expensive process. Some certifications have taken years, and the fisheries have paid the auditing firms up to $150,000 or more. Howes says that when a store sells MSC-certified seafood, the label announces to consumers, "We care where our fish comes from." He adds that as a growing number of food companies sell MSC-labeled seafood, executives of fisheries that don't have it are motivated to join the program. 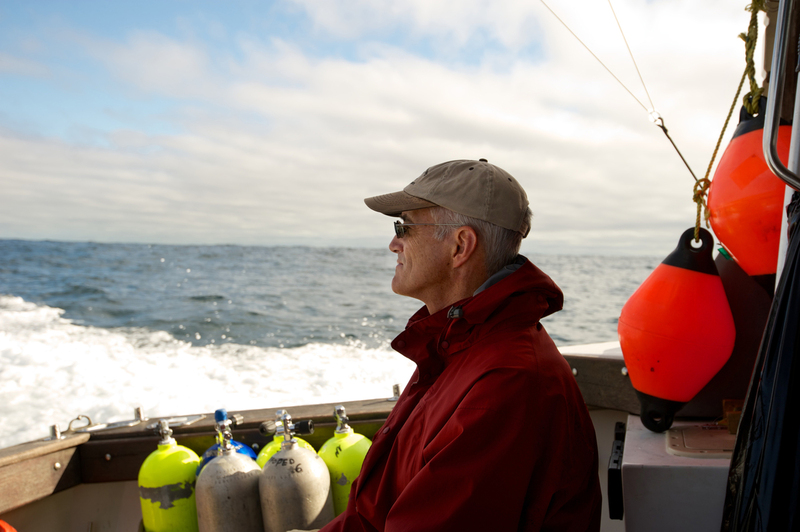 That catalyzes "real and lasting change in the way the oceans are fished," Howe says. During the MSC's first decade, there wasn't much demand for sustainable seafood by the U.S. food industry, and the MSC "almost went bankrupt," Sutton says. And that put the spotlight on the MSC's financial model. The way that executives structured it, MSC's budget comes partly from foundation grants. But some revenue comes from the licensing fees that MSC charges businesses for the right to sell seafood with the MSC label. So as long as many supermarket chains were not promoting it, the MSC wasn't getting much money. Then, in 2006, everything changed. The MSC and its supporters had sent a series of delegations to Bentonville, Ark., world headquarters of Wal-Mart. The delegations helped convince Wal-Mart executives to promise that all the seafood they sell in the U.S. would be MSC-certified by 2012. "We had to get Wal-Mart," Sutton says. "The significance of their commitment, of course, is that once Wal-Mart made a commitment to the Marine Stewardship Council, every other major retailer had to follow suit, because none of them wanted to be less progressive than Wal-Mart." Sure enough, other discount chains promised to go sustainable, too. "Overnight, the demand far outstripped the supply," says Sutton, "and so the suppliers had to catch up." Since Wal-Mart made its pledge in 2006, the MSC system has certified seven times as many fisheries as it did during the same period before, according to NPR's analysis. Still, the MSC system has not been able to certify enough seafood for Wal-Mart to meet its 2012 deadline, according to Bob Fields, a senior buyer for Wal-Mart and Sam's Club. The explosion in sales of MSC-labeled products at leading chain stores has transformed the organization's finances. The year that Wal-Mart pledged to promote MSC-labeled seafood, the MSC received most of its income from foundation grants — 75 percent, according to the MSC annual report. Meanwhile, it received only 7 percent of its income from label licensing fees. Today, those licensing fees generate more than half of the MSC's revenue. And since Wal-Mart executives embraced sustainable seafood, the MSC has also received millions of dollars in grant money from the Walton Family Foundation, which was created by Wal-Mart's founder and is governed by his descendants. The Walton Family Foundation has become one of the MSC's largest donors, according to financial reports. The director of the foundation's environment programs, Scott Burns, served on the MSC's board of directors before he went to Walton. Critics say that the day Wal-Mart embraced sustainable seafood, it was a blessing for the MSC system — and a curse. The critics charge that the MSC system has compromised its standards to keep up with the booming demand from Wal-Mart and other chains that followed suit. Fuller, of the Ecology Action Centre, says she has watched the MSC system "struggling with meeting the demands of the system that they helped create ... They have ended up having to lower the bar." When ocean specialist Daniel Pauly, a fisheries professor at the University of British Columbia, talks about the MSC today, he sounds dispirited. Pauly took part in early meetings in London that helped create the MSC and now says he has lost faith in the system. "The MSC is doing the business of the business community," Pauly says, not the environment. 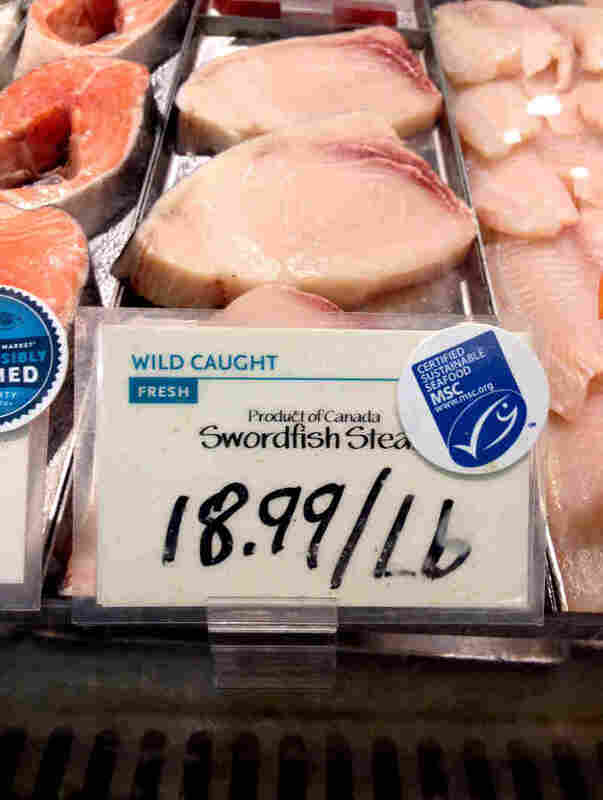 Some environmentalists and scientists say if you want to understand why they're losing faith in the MSC, look at the battle over certifying Canadian swordfish. Next time you buy swordfish at a store like Whole Foods, it might come from a controversial fishery off the coast of Nova Scotia. 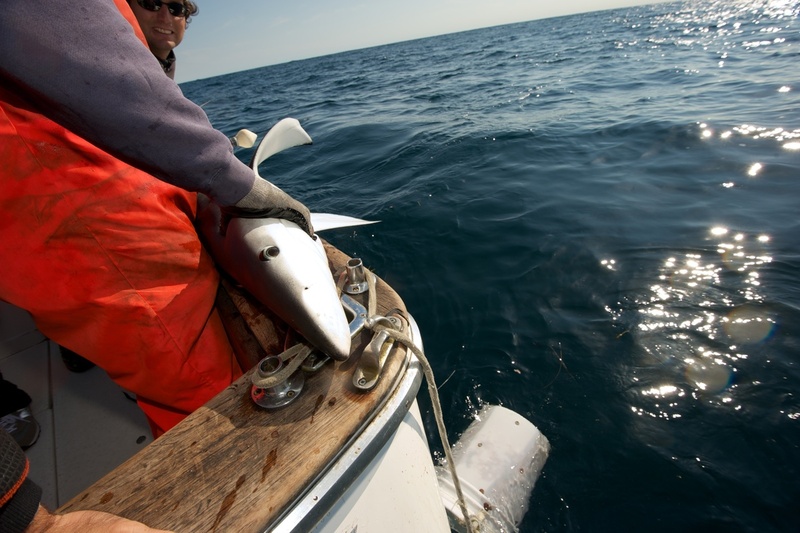 Fishermen have known for ages that when they go swordfishing in some parts of the Atlantic, they will accidentally catch sharks — lots of sharks, says Steve Campana, who runs the Canadian government's Shark Research Laboratory, near Halifax, Nova Scotia. Steve Campana runs the Canadian Shark Research Laboratory. He works to tag sharks with satellite transmitters to find out how long they survive after being caught and released. When NPR caught up with Campana one morning, he and his research crew were heading into the Atlantic on a 34-foot trawler, the Dig It. They were planning to attach sophisticated satellite transmitters to blue sharks. 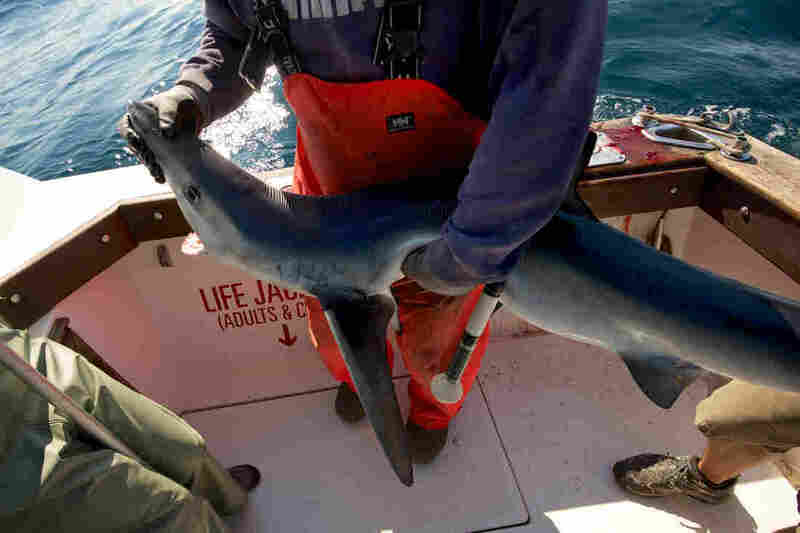 "On average, from what we've seen over the years, the swordfishermen catch about five blue sharks for every one swordfish," Campana said, holding onto a metal strut as the Dig It bounced through the waves. Add it up, studies suggest, and Canada's long-line swordfish boats — so named because they typically let out 30 or 40 miles of fishing line, dangling more than 1,000 hooks — accidentally catch tens of thousands of sharks every year. This touches on one of MSC's three fundamental rules, even though studies show swordfish are plentiful. The second rule says that a fishery is not sustainable if it does not maintain "the integrity of ecosystems" — which means, in part, that it's not sustainable if there is too much bycatch. The Committee on the Status of Endangered Wildlife in Canada, which is funded and appointed by the Canadian government, has warned that the main kinds of sharks that swordfishermen accidentally catch are "threatened" or "endangered" or "of special concern." Swordfishermen generally release the sharks. But there had been few studies on what happens to those sharks after fishermen let them off the hooks — until Campana and his colleagues came along. About six years ago, they started tagging sharks with satellite transmitters before fishermen set them free. 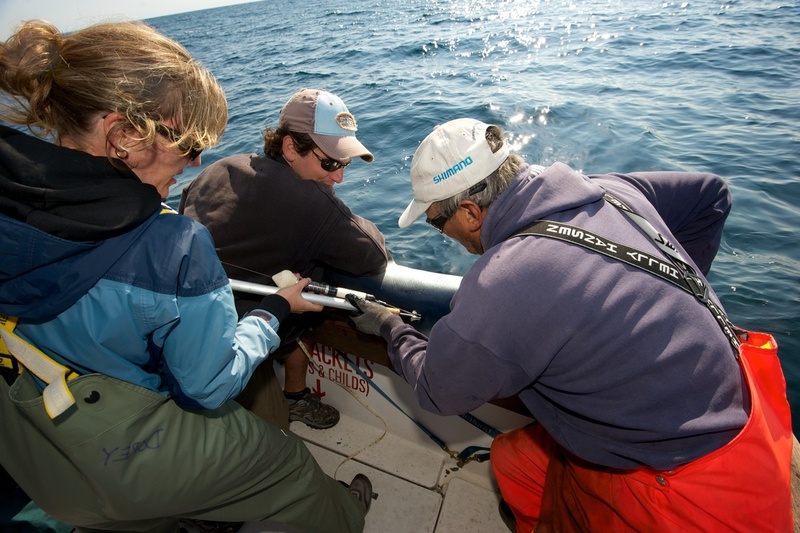 Shark charter operator Art Gaeten (right) and recreational shark fisherman Shawn Knowles struggle to hold a blue shark in position while shark biologist Anna Dorey attaches a satellite tag to its back. Researchers say about five blue sharks are caught for every one swordfish. Scientists are trying to determine what happens to the sharks after they are released. During one outing, the crew showed how they do it: They snagged a 5-foot blue shark on a hook baited with mackerel, reeled it in, and then pinned the thrashing shark against the boat's broad, flat railing. They jabbed a satellite transmitter, which looks like a turkey baster with a barb on one end, into the shark's leathery skin. And then they let the shark go, the transmitter protruding like an unsightly growth. The device is equipped with a computer chip that records data every 10 seconds, including where the shark goes, how deep it goes, and how long it stays there. After about 10 months, the tube pops off the shark and floats to the surface, beaming all the information via satellite to Campana. When the transmitter shows that a shark went to the deepest part of the sea and just stayed there, Campana knows when and where the shark died. Campana and his colleagues published some of their first findings based on these studies in July 2009, in the journal Marine Ecology Progress Series. Their studies showed that up to 35 percent of the sharks caught by swordfish boats die, either right on the hook or within days after the fishermen set them free. The findings suggested that Canadian swordfish boats accidentally kill almost two sharks for every swordfish they catch. Campana says that when you put these findings in context, it is troubling. Other studies suggest that the populations of major kinds of sharks in the North Atlantic have plunged as much as 40 to 60 percent in just the past few decades. "Any time you see consistent declines like that, and the fact that all of these large sharks seem to have declined all over the world," Campana says, "it's just a worrisome pattern." The president of Canada's swordfish industry, the Nova Scotia Swordsfishermen's Association, dismisses Campana's conclusions. Campana's report on shark deaths could not have come at a worse time for Canada's swordfish industry. Only months before the report was published, the association, which catches most of Canada's commercial swordfish, had applied to the MSC for certification. The industry sells much of its swordfish to Whole Foods and other stores in the U.S.
Those conclusions "were not close to what the industry felt was reality," Troy Atkinson, president of the association, says while sitting in his store, crammed with giant spools of plastic fishing line and boxes of heavy metal hooks. He runs the main business that supplies equipment to Canada's swordfishing fleet. "We're sometimes portrayed as a bunch of cowboys out to harvest the last buffalo," he says. "We're portrayed as some of the worst in the world. And it's just not correct." Atkinson cites reports by other researchers that conclude that the population of blue sharks off the coast of Canada is healthy – especially reports by the International Commission for the Conservation of Atlantic Tunas (ICCAT), which represents dozens of governments whose nations fish the Atlantic. So, Atkinson says, Canada's swordfishermen could catch and kill even more sharks without hurting the environment. Other studies suggest the evidence is contradictory, and that scientists don't know for sure what is happening to sharks across the Atlantic. For example, the optimistic ICCAT researchers whom Atkinson cites acknowledge that their conclusions are "highly uncertain" because they're based on unproven assumptions and incomplete data. However, studies showing that blue sharks have sharply declined focus on a limited region. So scientists and environmentalists were dumbfounded in early 2012 when the MSC system decided that Canada's swordfish industry can use the label "Certified Sustainable Seafood." "That is absolutely the kind of fishery that should not be certified," says Leape of Pew Environment Group. "That fishery is outrageous." Certifying Canadian swordfish "is the worst thing they can do, says Fuller, of the Ecology Action Centre. "That is not at all the way it should go." The Ecology Action Centre and dozens of other environmental groups denounced the MSC. The groups said in a letter to the MSC system that roughly 10 percent of Canada's swordfish are caught with harpoons — a method environmentalists support because there is hardly any bycatch. But the long-line boats that supply most of the swordfish catch a "staggering" number of sharks, as the environmentalists put it. "Certifying [Canada's long-line swordfish boats] compromises the credibility of the MSC," the groups warned, "and the sustainable seafood movement as a whole." Additional studies and information on sustainable fishing and labeling. Howes, from the MSC, disagrees. He says the controversy over Canadian swordfish "illustrates a key feature of the MSC program, which is the fact that the program is premised on science and evidence. That fishery has met the MSC standard." The analysts who evaluated the fishery for the MSC system agreed that the swordfish boats do kill large numbers of sharks. They acknowledged that the optimistic studies on sharks that the swordfish industry cites are uncertain, but they concluded that the weight of evidence suggests it is "highly likely" there are plenty of blue sharks left in the sea. The analysts also stressed that, by all accounts, other countries kill far more sharks than Canada's swordfishermen do. So, they said, Canada causes only a small part of the bycatch problem. "We are not saying that shark bycatch doesn't matter," says Howes. "What we're saying implicit within the labeling of that fishery is, the shark bycatch of that unique individual certified fishery is safe. It's within ecological limits." Barnes, of the Antarctic and Southern Ocean Coalition, says the controversy over Canadian swordfish illustrates why the booming demand for sustainable seafood actually threatens to hurt the movement more than help it. "The bottom line is that there are not enough truly sustainable fisheries on the earth to sustain the demand," Barnes says. "The retailers and wholesalers all want access to this kind of label because they're trying to ... make money with their consumers. There's nothing wrong with that; that's how the world works." But Barnes charges that the MSC is labeling some fisheries as sustainable — even when they are not — partly to fill the seafood counters at Wal-Mart and other large chains. "I'm not down on Wal-Mart at all, don't get me wrong," he says. "But to get on line with big chains as your goal leads you down a path that I don't think the originators of the MSC intended." Howes could hardly disagree more. "If you really want to contribute to the transformation of our economic systems more generally, you've got to engage with the big guys. And therefore, I absolutely welcome Wal-Mart's commitment," he says. "That will drive change." Howes continues: "Will that overload the MSC system? No." He argues that there's no way the MSC could label problem fisheries sustainable just to satisfy demand, because, he says, the certifiers evaluate each fishery based only on scientific evidence. But he adds, "We want to see oceans fished sustainably forever. We're not going to achieve that by becoming a small niche organization that engages with a handful of perfect fisheries." Researcher Barbara Van Woerkom contributed to this story.